Active Campaign announced their newest addition to the Active Campaign messaging suite: Site Messages. Site Messages are lightweight messages that display on your website to any segment of your users. Site Messages first appear as a small, animated notification. You might think of them as a chat pop-in (which are quite popular) or a highlight, wizard or guide you have seen across the web. And that is exactly what it is, but in this case connected to the Active Campaign database and your imagination. Marketers can include a brief message with emojis, a picture of a staff member, an icon to catch your visitor’s eye. The Site Messages can be used with many of the standard personalization tags in Active Campaign like date, geography, regular contact fields, page views, customer data, events, e-commerce Deep Data. Once the Site Message is clicked, it expands into a larger message on your site. Expanded Site Messages can either appear as pinned to the right, or as a modal in the center of the screen. 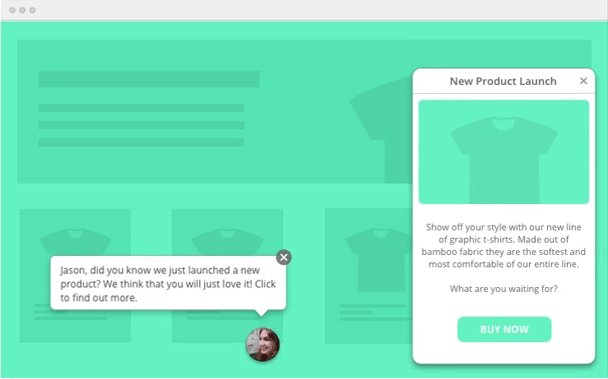 SaaS companies can use Site Messages to notify users of new features (like notify early adopters of beta releases). E-commerce companies can use Site Messages to display a one-time coupon code to segments of customers. Bloggers can use them to show breaking news stories to their logged-in users. Another way to use them is in Message continuity/reinforcement. A marketer can have site messages triggered by clicks in email campaigns so that when visitors land on the target website, they’re greeted by another message reinforcing your call to action or guiding them toward the next step in your funnel. Site Messages are available inside the automation builder, used the same way that marketers would create an email or send an sms message. Site Messages are available right now, on professional plans or higher.